Despite the fact that we live in a “Digital Age,” IKEA’s latest idea, “Logged out,” as pictured above from Business Insider, could possibly provide a better way to unplug at the dinner table. 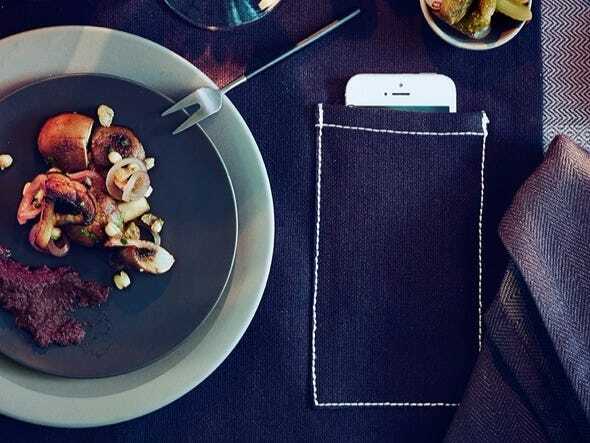 To that point, IKEA recently announced that they will unveil Sittning, an upcoming, limited edition collection of dinnerware which includes a placemat with a pocket that’s meant for putting away your phone during a meal. The Sittning collection includes over 40 pieces of dinnerware and is designed with composition and coordination in mind. The products in this collection are crafted with natural materials such as cotton, solid wood and mouth-blown glass. According to IKEA, “The best moments in life are the shared moments.” No, they don’t mean shared via social channels; they mean shared interactions that occur in real time, with real people. But, perhaps the most innovative idea from IKEA’s latest collection comes by way of a placemat. The placemat will be called, “Logged out,” and though it doesn’t physically log a person out, it does, in fact, hide your smartphone, so that people can get back to face-to-face communication. The placemat has a sleek, stitched pocket on the side, which is perfect for storing your smartphone. Not only does it keep your phone out of sight – though you can still see the screen light up when a notification comes through – you’ll also be able to protect your phone from food. IKEA’s latest idea, the Sittning collection, will be available for purchase in September 2015.